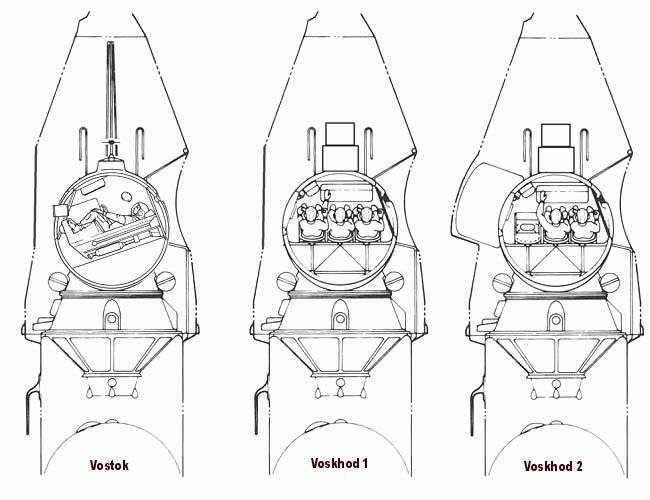 The Voskhod program was primarily designed to produce spectacular firsts in space flight. In October of 1964 the Soviets launched the first Voskhod mission. It was the first spacecraft to carry more than one cosmonaut, and among its three-man crew was a medical doctor. His presence aboard and the decision not to wear space suits were also firsts in the space race. The first spacewalk occurred during the Voskhod’s second and final flight in March 1965. 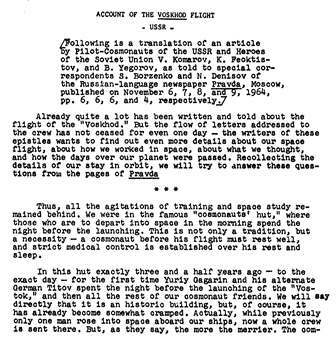 This is a first-hand account of the mission by two of the Voskhod cosmonauts as told to two correspondents from Pravda. Consequently, it is in the first person and has a rather vernacular appeal. The men begin by talking about the night before the launch, revealing personal relationships among the crew and among all of the other personnel engaged in the program. At parting, the heart always aches a little. Involuntarily, all three of us cried out one and the same thing: Goodbye, Comrades! Two scientists describe the challenges inherent to making the ship safe for the humans in it. They provide information on bodily functions, the impact of space travel on the crew, how to protect them, the biological compatibility of the crew, and what more is needed for future and longer flights. To be sure, many surprises await architects in space. The specific characteristics of space in which there is neither an atmosphere or gravity will give rise to many new problems, including those which today cannot even be foreseen. We will attempt to visualize how the most immediate problems of the near future will be solved: the character of the architecture of circumterrestrial space stations and research laboratories on the moon.